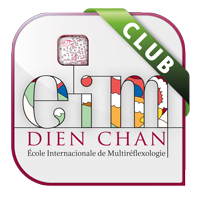 To start studying the different Dien Chan diagrams, you need at least the FACEASiT’pro version. In the section on studying the multirreflexology diagrams, the body is shown in red. 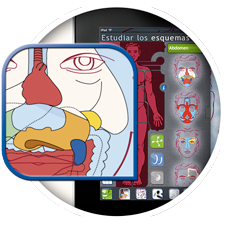 When you select a specific body part, FACEASiT proposes a list of all the diagrams that can be used to treat the area and restore its balance. From this carousel, choose the diagram you would like to study full screen. To move the anatomical body, swipe the grey curtain on which it is shown. A detailed fact file for the diagram appears and disappears when you click the button showing a blue speech bubble. This button lets you view the menu of diagrams related to the selected body part. Use this button to hide (or show) the body and view the diagram full screen. This button lets you see the essential points of the selected diagram, superposed. + More details about the fact files for each diagram on this page. To familiarize yourself with the map of Dien Chan set points, you need at least the FACEASiT’pro version. In the section on studying the set points on the face, the body is shown in blue. 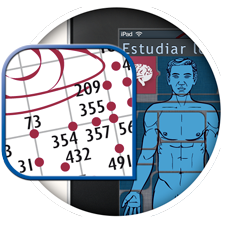 When you select a specific body part, FACEASiT proposes a list of the BQCpoints involved. From this list, which will appear on a horizontal menu, select a point to obtain the list of diagrams with which it is related. Please note that the diagrams presented in this section are related with the selected BQCpoint, not necessarily with the chosen body part. This is what makes multireflexology complex; it allows us to make bridges or interconnections depending on the disorder and our knowledge of physiology, function, etc. The fact file on the point appears and disappears when you touch the button showing a blue speech bubble. This button lets you see the menu of diagrams related to the selected point. It also allows you to alternate views of the diagram and the location of the selected BQCpoint. Use this button to find a specific BQCpoint and view it on the face. + More details about the fact files for each point on this page. 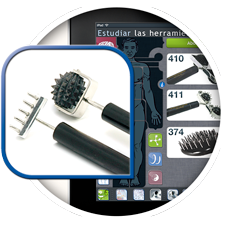 When you simply want to massage a specific area to stimulate the self-regulation process, FACEASiT allows you to optimize the use of tools. In this section, the body is shown in a dark colour. When you select a body part, the recommended tools appear for local treatment—that is, directly on the chosen area. In this case, the treatment given is not reflexology; we are simply using the yin and yang effects of each tool to restore the area’s balance or to relieve local pain. From the main tool menu, you can access the complete fact file for more details or to purchase the tool. For information about buying the tools, please visit the tools page. Directions for use on the selected body part appear when you click on this button. This button allows you to find a tool in the catalogue by reference number.